Max is a kid who gets extreme happiness out of seemingly small things, whether it's watching construction workers fix the roof on our house ("NEW ROOF!" he keeps telling me), coming home with a purple ballon from a birthday party or getting a Lightning McQueen shopping bag. (Hey, were you the one who left that on our doorstep this weekend?!) 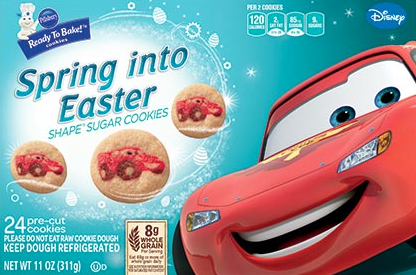 So when a Facebook friend told me that Pillsbury had Ready To Bake Lightning McQueen cookies, I got giddy just thinking about Max's reaction when I got them for him. Last week I sent Dave out on a search expedition to find a store that had them and he came home with three packages. Saturday afternoon I said, "Max, I have a surprise for you!" "Cars 2?!" he asked, hopefully. I smiled. I reached into the freezer, and pulled out a package of cookies. Max's face lit up. He stared at the box, fascinated. He let out a little giggle of excitement. "Yes!" I said. He giggled again and gave me a kiss on the cheek. These cookies are awesome for kids who have challenges with fine-motor skills, because they're pre-cut. 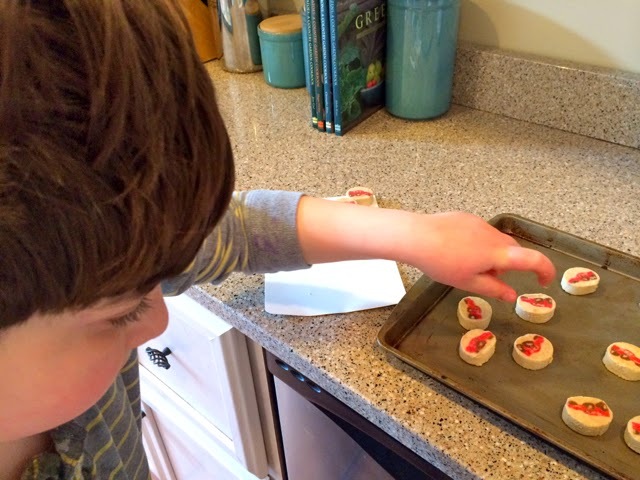 Kids just have to grasp them, however they can, and plop them onto the baking sheet a couple inches apart. We preheated the oven to 375 degrees and popped them in. "Light!" said Max, and I turned it on. He stood there practically the entire 10 minutes, watching them expand. The cookies were super-soft coming out, but they hardened up within a few minutes. They were a little too crunchy for Max's chewing abilities so I crumbled them and placed bits on his back molars. "Mmmmm," he said, clearly impressed with his baking skills. Then he asked for another. Then he offered me one, which is how I knew he really and truly loves me. 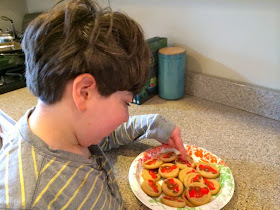 Yesterday morning, Max took a plate of Lightning McQueen cookies to school. His teacher said they were the first thing he showed the kids, and he was so excited. I am planning to get a bunch more packages, since they are seasonal, so if you live near me I'm very sorry for snapping them all up but may I please borrow a portion of your freezer? I am still riding the high of Max's happiness. Life as a special needs mom certainly has its lows. Low low low low lows, with heaping sides of worry, stress, frustration and what-ifs. But the pure joy Max expresses blisses me out every single time. Like therapy, only better. And free. It's typically a quality that very young children possess, this unabashed glee over simple things they adore. Max still has it. And it is delicious. And I hope he never grows out of it. Want soft cookies? Bake them for less than the specified time, say, 7 minutes instead of 10. You can also line the baking pan with (non-stick) foil so you can immediately lift all the cookies off the pan as soon as they're out of the oven, since otherwise they'll continue to bake and harden while they sit on the hot pan. Of course, this latter suggestion puts you at great risk of sliding them all onto the floor, so be sure to do it over a table or countertop! Brilliant anonymous expert baker, thank you! Really helpful to know, softer cookies would definitely be a better bite for Max. I loved this story! And I totally get it! Here's what you have to look forward to... those shiny moments continue but they get more expensive. Guess what Ms. 18 did on Saturday? She went to an R5 concert and did the meet & greet before hand so got to hug the band and get a photo. For a premium price of course, but money couldn't buy the smile on that girls face. 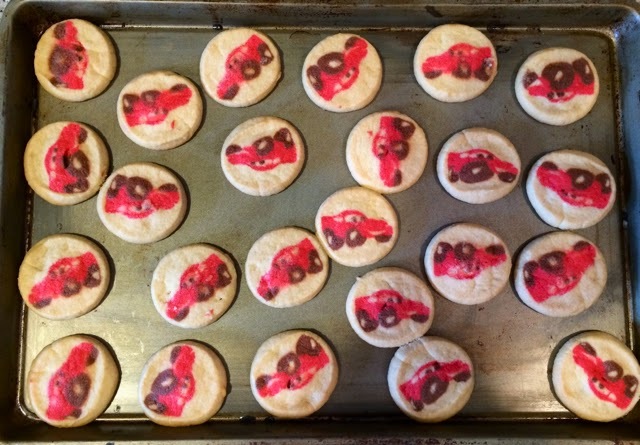 I remember my mom making these cookies for me. They tasted absolutely delicious, though now I can make the scratch-baked variety. It's good to see Max helping in the kitchen. That pincer grip looks awesome. If you have a toaster oven you can bake just a few at a time for a super quick treat. I love this! 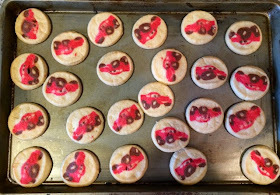 I'm going to try and find these cookies today because my son would LOVE them! Glad Max enjoyed himself so much! I'm so glad that I met you and am reading your blog! I could picture Max being so excited about the cookies! Thank you for sharing and for reminding us that sometimes the little things are really the best! I get it. The first time my son walked was one of the best moments of my life. I'd been told he wouldnt walk independently but he did on Saturday afternoon at a local park. Its the things that parents with "typical" kids dont get that make us hopeful.